For the past four years some of our winter wood supply has come from the woods across the road from our house… but we have cleared out most of those storm-damaged trees and we are always looking for a new firewood source. The price for hardwood keeps going up… currently hardwood that is stove length, split, and delivered is selling for $300 or more per cord. The standard for “stove length” and “split” in this area seems to be huge chunks that are often more than sixteen inches long, even when we have asked for a smaller size, which means that when we have purchased firewood in the past, we have had to do a lot of re-splitting and re-cutting to end up with firewood that would work in our cook stove. 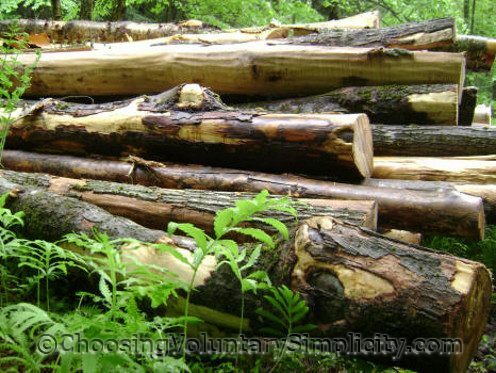 Since we have to do all that splitting and cutting anyway, we have always wondered if a better solution would be a load of logs. Ordering a load of logs turned out to be more complicated than we thought it would be because very few wood people sell uncut logs, and the few who do make only very local deliveries. We made multiple telephone calls, asked around, and followed any lead anyone gave us, but got nowhere. Then one day at the feed store another customer was talking about someone he knew who had just purchased a load of logs, and he was willing to try to get a telephone number from this person for us. That number led to another number and another number… and finally to someone who did sell logs and who would deliver them to us. We ordered our logs that same afternoon and they told us to expect delivery in approximately two weeks. We would pay $700 for a full truckload of logs, which they told us would be somewhere between seven and nine cords of wood… but that we could count on a very generous eight cords. To buy eight cords of pre-cut firewood would cost us $2,400, so it seemed worth the $1,700 savings to buy the logs and do the cutting and splitting ourselves. Early in the morning on delivery day we received a telephone call from the driver of the truck, who said he was on the way to our house and wanted to verify the directions. About an hour later the logs were here. 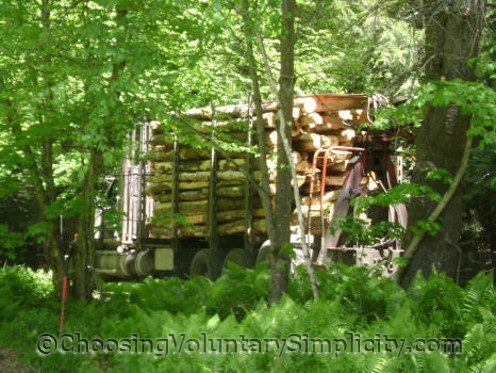 It WAS a very full truckload… several of the neighbors commented on the size of the load as they waited behind the truck during the forty-five plus minutes it took until all the logs were unloaded. 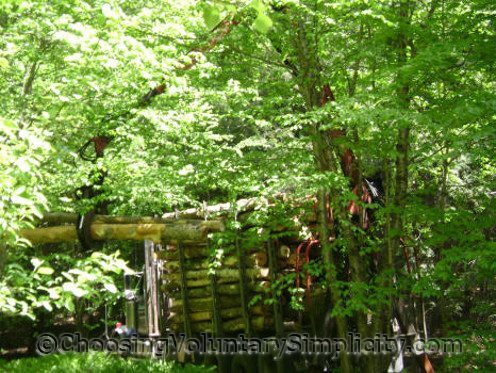 Everyone watching was impressed with the driver’s skill as he maneuvered the logs through the trees and over the ferns before gently placing them in the open area at the far end of our meadow. 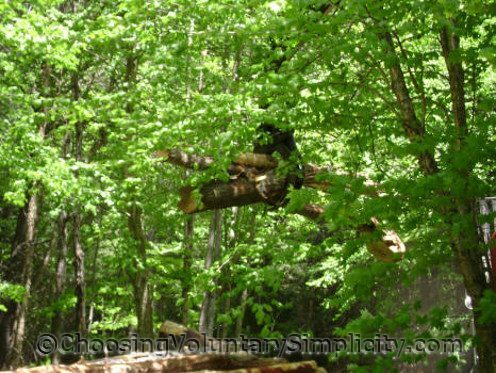 Incredibly, he managed to unload all of the logs without damaging any of the trees or leaves. My husband made a rough count of the logs as they came off the truck… nearly a hundred… and most of the logs were about eighteen feet long. With the cutting, splitting, and stacking, we had a lot of hard work ahead. It started to rain really hard just minutes after the logs were unloaded, and rained steadily for days… but guess what we were doing that weekend after the sun came out again! What Did People Earn in 1860? That sounds like a great idea. It’s cheap compared to the alternative and the hard work you guys will be doing will make you appreciate the wood during the winter. That must have been really exciting, watching those logs get delivered, I wish I could have seen it myself in person. DH and I burn wood and we have the same problem you mentioned, the pieces are kind of on the big side, even though we always put in a special request for them to be smaller. Most of the pieces still fit in our stove, but just barely, you have to be careful putting them in. I wish we could get our own logs delivered and cut them ourselves, but that just isn’t going to happen, and besides with our small house I think a load of logs that big would last longer than we will!! 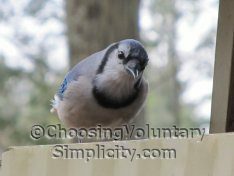 Thanks for a great post and some great photos, this is why I love to read Choosing Voluntary simplicity. I think you guys have a great attitude: see what’s needed, take steps to acquire it, don’t be afraid of some hard work. We don’t burn wood any more, but back when we lived a little deeper in the country it was our main source of heat. I have many fond memories of working with my wife and sons splitting and stacking our firewood. Thank you for taking me back a few years. This is so cool! How long do you think it will take to cut up all those logs? Great looking load. You will use less wood if you get a couple of years ahead. Most hardwoods don’t drop to less than 20% moisture until after splitting and then 18-24 months. Come to my neck of the woods! We had a big storm hit here in Southern IL and there is firewood for the taking at nearly every house and several dump sites where the county is burning the felled and uprooted trees by the tractor-trailer load. I hate to see this slash and burn clean up effort knowing the four trees we had to pay $3800 to cut down or remove could be heating someone’s home. I’m also salivating over your wood stove. I want one but don’t have anywhere to put it nor can we afford it. Buying logs by the tractor/trailer load is the only, way we buy our wood. Out here in the Rockies of Montana, it is as easy to find a Logger who will haul all you want as it is to build a fire! lol. We buy the full pole length. 50 to 60 feet and off 1 truck we average 8 to 9 cords, a true 4x4x8=128 cubic feet cord. When we place a oder with a logger we know, we go ahead and buy 5 truck loads. We do not burn that much in one full year, but we do burn half that. We have more than enough under roof storage space for all we buy and split. We know we are lucky in the respect we can do this and have as much land as we do. We live off the grid at right about 5700 feet up. I love the way you think! and I’m loving your website. I do that with just about everything, think if there is a cheaper alternative to what I am buying in a different form. You are giving me some great ideas! Keep up the good work! Thank you for this lovely and informative site. It’s a real jem. I’m jumping into a simplistic Wisconsin winter. This is really helping! I like the website, some great ideas for sure. I did the fire wood by the truck load this year too. I live in Ottawa, Canada and paid $1200 delivered with taxes and all. I got about 6.5 to 7 bush cords and it took me 3 weeks to cut it all in 16″ pieces via a chain saw about 1.5 to 2 hours a day. I then rented a 2-way splitter (Splitfire woodsplitter – awesome little timesaver machine) for $113 for a full weekend. It took 2 adults about 12 hours (24 hours total) to split it all in one weekend. Plus about 1 gallon in gas for chain saw and splitter. I assume I got about 35 face-cords out of the truck load. So after $1200 for the wood plus $113 for the splitter rental and $400 for the chain saw and the $5 in gas and oil I spend about $50 a face cord. If I buy it, it’s about $100 on average for split and delivered mixed hardwood, 16″ long. If I would figure in my $50 net pay per hour it’s only a workout though. Since I don’t count the time, I see it as great savings and great activity! I hope this is a great feedback about what it costs and what I got out of it here in Ontario, Canada. We go one step further, grow our own trees, and fell (coppice) and cut them into suitable lengths. So aside from the saw costs, we’re up for about 3 or 4 tanks of gas in the saw. I certainly wouldn’t do it if I needed to purchase logs. At the end of winter, I split them and we pile them up in the shed to dry, then cut more trees into lengths to place in the outdoor pile.